Not long ago I got to spend some time in Lancaster, Pennsylvania. That's right, the home of James Buchanan, Dutch Wonderland, and Armstrong World Industries. I hadn't spent much time in Lancaster in well, forever. But forever ago I was fairly familiar with the place which made going back so interesting. However, instead of staying in Lancaster proper, my hotel was in Leola, just outside the city. The hotel was a collection of small vernacular buildings that had been adapted into a hotel with conference facilities and chic shoppes. It had all the things good hotels have including friendly professional staff, clean and quiet rooms, great beds, and toiletries from some swanky-sounding company you've never heard of. On the other hand, I did think it a tad disconcerting that the exterior of the place looked like Lancaster County while the interior was sort of Italian Provincial meets Yorktown, Virginia's late, great Nick's Seafood Pavilion. A nice thing about staying in Leola was that I was close to rural Lancaster County, and by rural, I mean actual farms populated by actual Amish and not the rear parking lots of outlet malls on Route 30. I had the opportunity to go to an Amish farm near Leola and I was quite surprised at how different it was from the Nebraska Amish place that used to be next to my sister's farm. The Nebraska Amish family was on the scruffy side, to put it mildly. The place near Leola was spotless. Seriously, I think you could have eaten off the driveway, it was so clean. 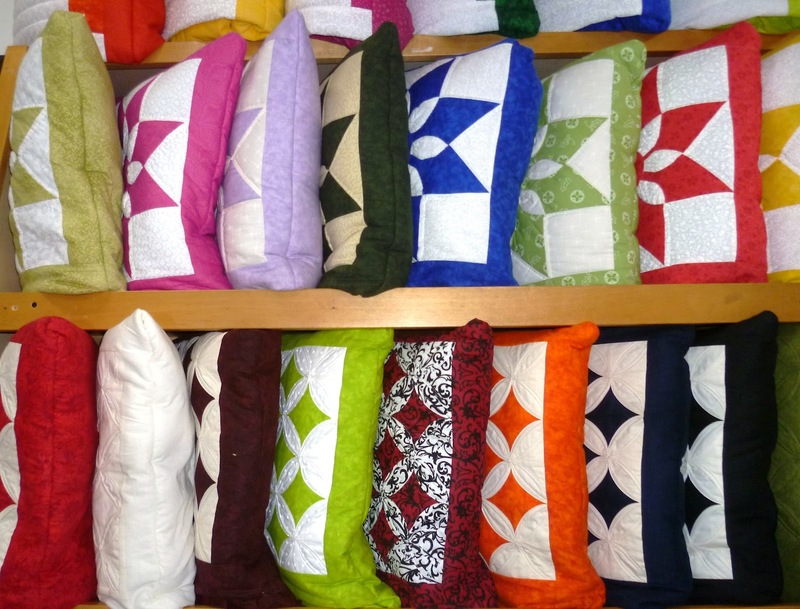 In addition to operating a farm, the family ran a craft co-op where they sold quilts, dolls, tchotchkes, and even Amish romance novels. 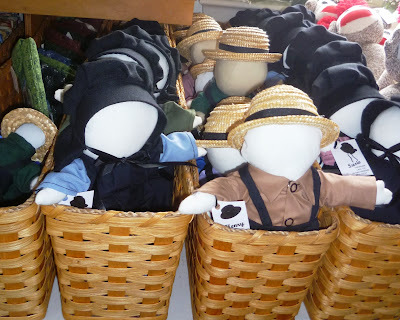 I think groups of dolls always look sort of creepy. Even if they are quaint Amish dolls, when you put a bunch on a shelf it's enough to give me the willies. I just can't face another day stuck in this Longaberger basket. I had a conversation about chow-chow just the other day. Lancaster County is the home of seven sweets and seven sours. At least that's what the sign at Miller's Smorgasbord used to say. I don't know if they were made for the tourist market or not, but the pillows were my favorite thing. When it comes to electricity, it's so close and yet so far. The catering business may be booming but it wasn't booming enough to purchase a decent sign. No way am I rooting around in some country store trying to figure out which item is 25% off. After the visit to the Amish farm, I had some free time and so high tailed it to Lancaster City with my RULE classmate Patti to see how it had changed in the 30ish years since been there. I knew that Lancaster’s grand department store, Watt & Shand, had closed, and that the building had been demolished, except for the façade. I wanted to see the new Marriott Hotel and Convention Center that had been built behind the old store's façade. Wow, it's big. WAY bigger than I expected. I would have taken more photos, but it had to be the coldest day of the winter. Ok, ok, ok, there have been worse days this winter but a cold day in the middle of a mild winter makes me act as if I have been transported to Antarctica and I’m about to meet the same fate as Capt. Robert F. Scott and his not all that merry men. In other words, sorry for the one lousy photo of the building but no way was I standing out there freezing my point 'n' shoot off. So it’s a Marriott on the outside, but on the inside the Marriott has really stepped up and it’s sort of like a W, the happening Westin brand. Who knew that Lancaster had so many hipsters? 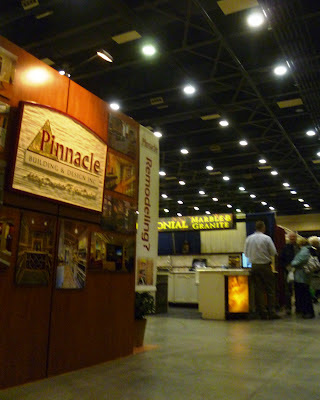 As Patti and I wandered around the hotel we found that we'd hit pay dirt when we stumbled onto the home show in the convention center that opened onto one end of the hotel lobby. I haven’t been to that many home shows, so perhaps they’re all the same. Judging by the booths in this show, the people of Lancaster County have water in their basements, skanky bathrooms, and are just discovering granite countertops. There were lots of aging former jocks in their corporate golf shirts with slick displays of the portfolios of the hideous McMansions they’ve built. Apparently aging jocks like McMansions plopped out in a field someplace. At least they like them way more than aging band geeks do. In addition to the slick and semi-smarmy corporate types, there was the occasional Amish or Mennonite guy with a bowl haircut. Unlike their English compadres, they were not standing around talking about golf scores. They seemed very earnest and ready to make a sale. 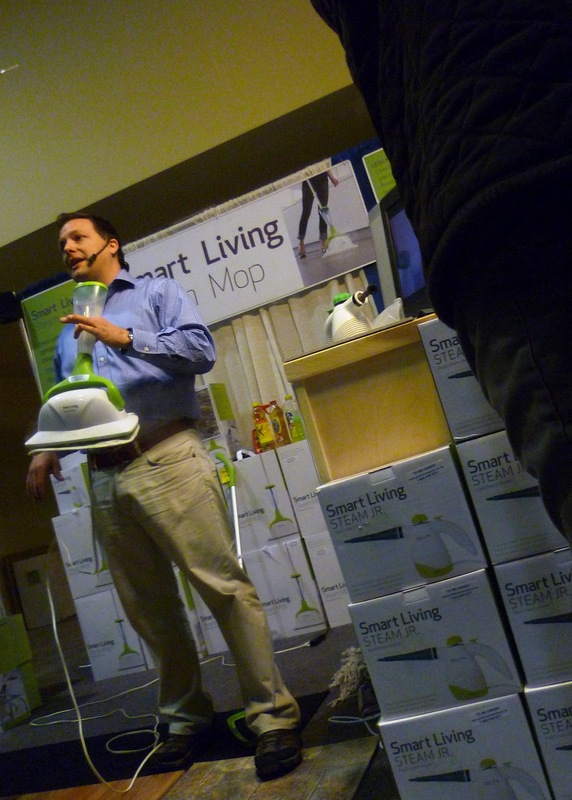 Also wanting--almost desperately--to make sales were the product demo guys. Patti says this SweepA rubber broom thing really, really, works. According to the SweepA web site, it's especially valued in the hairdressing and meat industries. Interesting combo there. Then there is the Smart Living Steam Mop. The sales guy had one couple absolutely hypnotized. I have no doubt that he could have asked them to take all their clothes off and recite beat poetry and they would have done it right then and there. 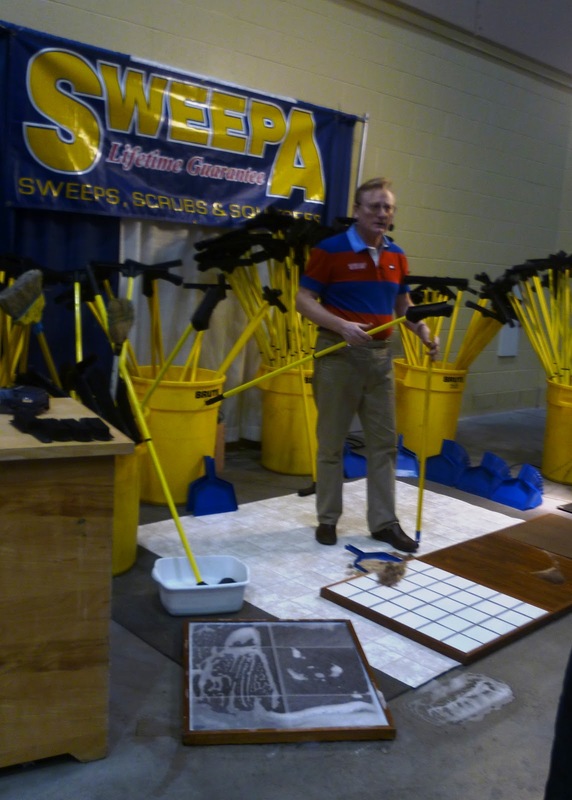 The product packaging is very slick, but when I went to the web site for the mop there were tons of comments about it breaking and generally being a piece of crap. And the company hasn't bothered to take them down. I'm not sure who is more clueless, the mop manufacturer or the consumer. There were other live demos, too, including a couple of cookware demonstrations, but I didn't feel the need to watch some yahoo make Lebanon bologna cobbler and other local delicacies. The product demo guys did make me wonder if people in this line of work go to their high school reunions and cop to what they do for a living. Or is it sort of like making a living by scraping the road kill off highways for PennDOT, and not something that you want folks to know about? The hot spot of the show (literally and figuratively) was the Sauna Magic booth. 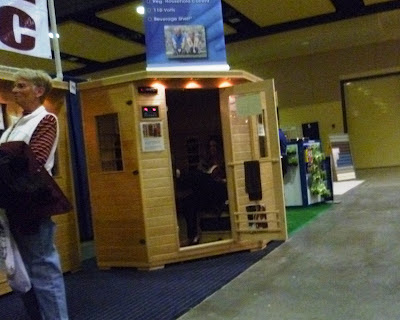 Patti and I were about to walk by when we noticed Miss New Jersey (not her real name) sitting inside the sauna reading a novel. While you may be thinking that the book was Jane Austen, my money is on Jackie Collins, only trashier. We piled into the three person sauna, which was going at full blast, and that was the clue for Miss New Jersey (not her real name) to share and share and share some more. She was from Exit 7A on the Turnpike and yes, she had a sauna at home. She would have enjoyed being in the sauna in Lancaster with two other men. (Saying "What am I, beef jerky?" did cross my mind.) Miss New Jersey (not her real name) did not specify that one had to be named Vinnie, but I am thinking that would have been her first choice. We learned that saunas have many therapeutic effects such as rearranging your heavy metals, heating up your bunions, and generally making you sweat a lot. Hot tubs, on the other hand are for socializing and covering up the bouquet of cheap red wine with a bouquet of cheap chlorine. Miss New Jersey (not her real name) offered us a great deal--those babies were priced to move--but neither Patti nor I were in the market for a sauna, unless of course, it included a Jersey girl and a Jackie Collins novel. Actually neither Patti nor I weren't really in the market for anything. Not for a McMansion. Or a sauna. Or a pink pig gas grill, which is probably the only pink item in the world not licensed by the Susan G. Komen Foundation. However, we were both a bit peckish and in the market for a brew, so we reluctantly bid farewell to the Lancaster Home Show and headed out to dinner. What exactly does an Amish romance novel consist of? Hot and heavy descriptions of....a sheet with a hole cut in it? I must confess, I didn't crack one open. But if I had to guess, I would bet they feature a lot of pious but knowing looks between Samuel and Mary across a piece of freshly baked shoo-fly pie.